Schöne Ocean Front Familienfreundlich Beach House. Dieses Haus verfügt über eine Terrasse im zweiten Stock teilweise zum Entspannen mit einer tollen Aussicht abgedeckt. Das Haus liegt nur 50 Meter vom Wasser entfernt. Leistungsstarke AC im ganzen Haus. Kabel. Gratis Wifi. Und das Haus ist für den Urlaub gebaut! Drei Außenduschen ermöglichen es mehreren, sich schnell abzuwaschen, um sich auf andere Aktivitäten vorzubereiten. Holzboden im Obergeschoss ergänzt das Haus. Sieben Einzelbetten, ein Queensize-Bett und ein Kingsize-Bett ermöglichen große Familien oder Gruppen. Bettwäsche, Kissenbezüge und Handtücher sind möbliert. Bettdecken, Decken, Matratzenüberzüge und Kissen sind möbliert. Stichwort: Ocean Front Beach House. 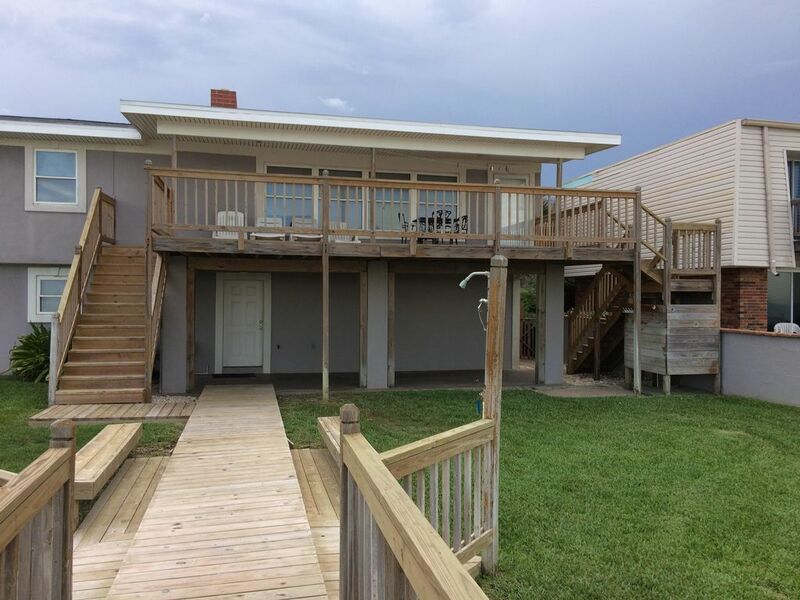 Perfect location, beachfront and near some fun night spots (able to walk). Comfortably fits 4 adults and 2 kids, very likely more. If you want to be right on the beach, this is the house for you. It's an old fashion beach home with character. If you are looking for a house with lots of room for your family, this is the one. There was amble sitting in the main room, good beds and a well equipped kitchen for cooking large meals. There were plenty of dishes and lots of tables for eating and sharing your meals. There was even a table on the porch so you could have your breakfast or afternoon snacks, or early cocktails while looking at the beautiful ocean view. Great place for golf trip with new and old friends. Right on the beach. Quiet and enjoyable! It was a great house that fit us all comfortably with great water access! A very short walk to the uncrowded beautiful beach. House is spacious and the air conditioning worked very well. Inside could use updates, but on a whole we were all content. Take your own beach chairs as five out of the seven available are broken. Extra bonus was the tortoise that has a hole in the dune right off the boardwalk to the beach. It was a good setting for five adults and two children.